I’ve twice in the past week driven along part of the first stage of the Tour de France, between Harewood and Skipton in Yorkshire, the county of my birth. It was great to see the enthusiasm with which God’s Own County has seized on the opportunity to host Le Grand Depart. Shop windows in towns such as Ilkley and Otley showed the art of window dressing is alive and well; yellow painted bikes of all shapes and sizes were placed along the route, in hedgerows and gardens and attached to house and pub walls. Addingham gets two bites of the bike-shaped bunting, as it’s where the route of stage 2 crosses that of the first, round the Dales route between Leeds and Harrogate. This being Yorkshire, there was also evidence of the entrepreneurial spirit of local business people and farmers. Fields along the route were either fiver-a-day parking for visitors to avoid the tow trucks keeping the roads clear for the peloton, or temporary camp sites for spectators. Every pub seemed to have a roster of live bands cued up to play, and there were other cycling events taking places either side of the tour. As it happens, I live just off the third stage in South Woodford, a few metres from where the Cambridge to London stage passes. I’m sure there’ll be crowds on the day, but there’s not the same scale of local engagement with the race that’s apparent in Yorkshire. So well done to the Village Bookshop in Woodford Green for its window display and to Woodford Motor Company for plonking a yellow bike on a car roof. It’ll be a grand day out whether you are in Yorkshire or London. 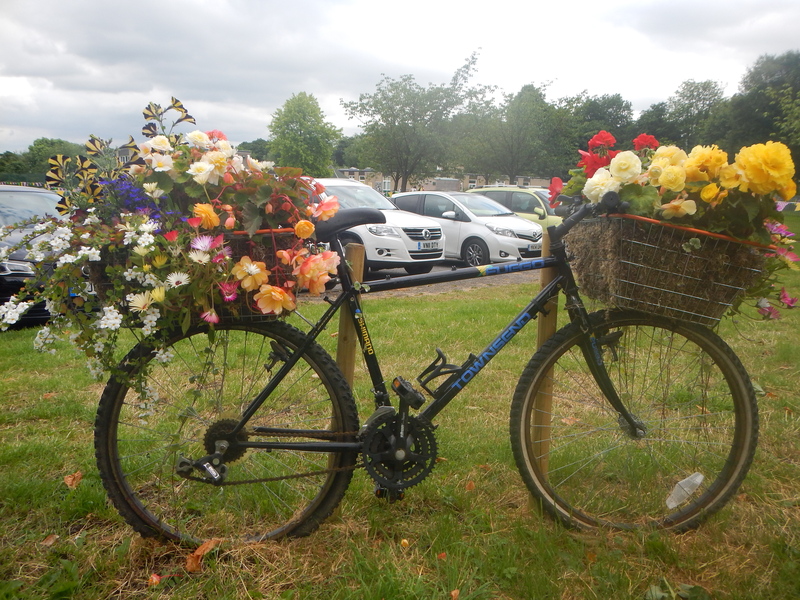 This entry was posted in Cycling and tagged Cycling, South Woodford, Tour De France, Yorkshire on July 5, 2014 by paulnettleton.